Few publications aspires to the title "Bible readers." The book The Beatles in songs and images that in the second half of the sixties compiled by renowned British artist Alan Aldridge, however, deserves the epithet. The Czech translation and in some cases also gave the original readers in Czechoslovakia joy and hope in difficult times. Each surviving copy was becoming a valuable relics tattered hundreds fingers. The original title was published in two volumes in 1969 and 1971, the Czech released the first episode in 1969 in Prague Panton. The domestic readers now, after 44 years, receives publication again - but in a revised and above all complete form. The book The Beatles in songs and paintings is a kind of unique work. It contains a selection of the best texts such as The Beatles Can not Buy Me Love, A Hard Day's Night, Rocky Raccoon, Revolver and Yellow Submarine. Ty but also interlaced with funny comments John, Paul, George and Ringo. To illustrate the interpretational and often elaborate carefully selected drawings, graphic works and photographs by leading artists of the time. Epic book faithfully reflects the surreal and psychedelic world in which The Beatles lived and worked. And demonstrates the enormous influence of the "bugs" on the lifestyle of their generation. Besides editor Alan Aldridge to participate in book form by renowned authors such as Clive Arrowsmith, David Bailey, Mel Calman, David Hockney, Ronald Searle, Peter Max, Ralph Steadman, and many others. The acquisition of rights and publishing the book publishing efforts Svojtka & Co. more than twenty years. The situation was complicated by the fact that in addition to the copyright to the book edition and the illustrations had to negotiate even the copyrights to the songs, in parallel. "To the book I have a personal relationship for several reasons. I am a great admirer and fan of The Beatles. To this day own the original Czech edition of the first part of the book, published by Panton Prague, and it's one of my favorite books. That is why we are preparing a publication devoted the utmost care. I hope that readers will do the same joy as ourselves, "says publisher Václav Svojtka. 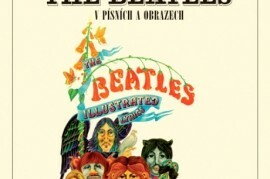 The first Czech edition of the iconic publication in The Beatles songs and pictures on the threshold normalization happened for a long time last rays of freedom and joy. British and American music led by bands like The Beatles and The Rolling Stones had featured a flurry of so little else of the free world. Poor quality tape recordings and sometimes expensive LPs to often get Daly, but with the press, photographs and video material or texts performers was significantly worse. I therefore book The Beatles in songs and paintings have become rare grail of unbridled joy, the navigator secretly breaks in the classroom and on the weekend partying. At the same time fulfill a unique function of creative art tools, information and source of inspiration. In some prints were pencil recorded more or less laboriously intercepted chords, other fans tore up the whole page. Pages are no other books were hand copied many times a variation of the time when the copier in Bohemia music distant future. Thus helped translucent tracing paper to redraw the design in the memorial square raster enlarge photo to create a poster or a manual master templates, carved with a razor blade Astra to Thursday. Let's face The Beatles, redrawing or sprayed through the first spray paint for shoes, appeared on T-shirts, school bags aboard, cases for musical instruments and the guitars themselves. And on the walls: need to Kampa. Alan Aldridge in the sixties, decided to try to persuade the UK's leading artists to create his illustrations to the texts of The Beatles visual accompaniment. Also addressed the fans who have sent their own visual designs to the songs, which so profoundly influenced an entire generation. And this intention he came out totally. Alan Aldridge is a British illustrator and graphic artist. Also inspirer, co-author and editor of the book, a close friend of The Beatles, nicknamed The Man with the Kaleidoscope Eyes (Man with kaleidoskopickýma eyes) according to the same songs. His work influenced art-house face 60 and 70 years. He has authored numerous book covers, especially from the sci-fi, drama and film posters. For his outstanding work to name the album covers of Elton John (Captain Fantastic and the Brown Dirt Cowboy), the second album The Who (A Quick One) movie poster by Andy Warhol and Paul Morriseyho Chelsea Girl or the famous Hard Rock Café logo. Gained great popularity and a picture book inspired by the poem British author William Roscoe's The Butterfly Ball and the Grasshopper's Feast (Butterfly afraid of a mare throws). Another author who has contributed to books on The Beatles, Clive Arrowsmith, a world-famous photographer who created portraits of David Bowie, Mick Jagger, Kate Bush, but also Anna Netrebko, Daniel Barenboim, Jeremy Irons, the Dalai Lama and Prince Charles. He is also the author of numerous album covers (eg, Band on the Run Wings McCartneyových). As the only photographer in the world created two editions of the prestigious Pirelli calendar. Equally significant contributors were also probably the best British photographer David Bailey (still active icon of world photography, became the prototype of the hero of legendary film by Michelangelo Antonioni's Blow-Up), one of the most influential British artists of the 20th David Hockney century, renowned cartoonists and Mel Calman cartoonists, Ronald Searle, Ralph Steadman and Peter Max. Hazardous acid: harmful to teeth? Facebook allows teens public profile. How to face the new challenge of online ..
"O children, death and bereavement"
As the birth of democracy in Burma?